Many people confuse modern day senior living facilities with the age old concept of “nursing homes” with mundane activities, dark dreary hallways and rooms filled with melancholy old people. Many senior living communities far surpass expectations by offering services that cater to the lifestyles of its residents. 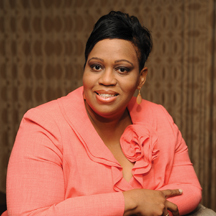 Many seniors move into Assisted Living due to specific physical needs. Newcomers are often met with a social vibrancy and an upbeat setting which offers them a new lease on life. “I am able to be me and do many of the things I enjoy doing with people” says Rose Smiley, a resident in Foulk Manor South’s Assisted Living. It’s not at all unusual to witness Smiley with a microphone in her hand singing impromptu melodies with a band playing at a Foulk Manor South party. A tremendous barrier for many seniors who don’t want to take that leap of faith by moving into a senior living community is the idea of not wanting to leave their homes. While this sentiment is one that many can relate to, the physical and cognitive benefits of embracing a setting that offers socialization and companionship are far too great to ignore. Increased attention is being focused on the importance of socializing and maintaining human relationships throughout life. Experts on aging have long suspected that socialization improves physical and emotional well-being, increases mental alertness and encourages a more active lifestyle. New research studies confirm these benefits. Pinpointing the mechanisms behind the protective properties of human interaction lessens the risk of Alzheimer’s disease, promotes heart health, improves symptoms of depression and minimizes the effects of stress. 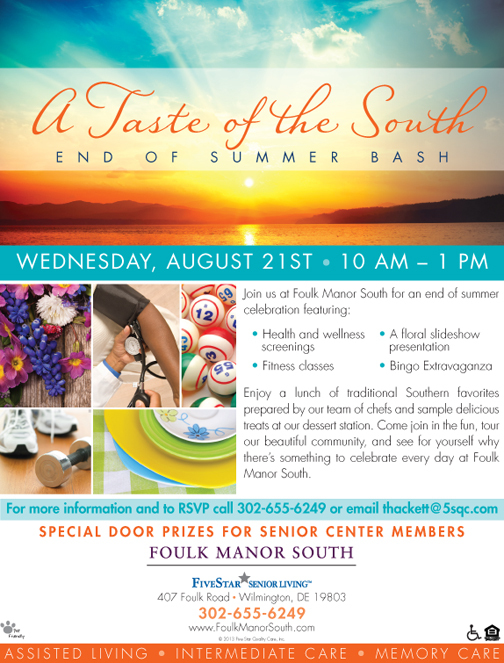 To celebrate the end of the summer season, on August 21st Foulk Manor South Senior Living will be hosting “A Taste of the South”, an event that will be open to the seniors who are interested in exploring what Assisted Living is all about. Visiting communities during special events is a great way to meet current residents, tour facilities and gage the overall ambience of life in a senior living community. 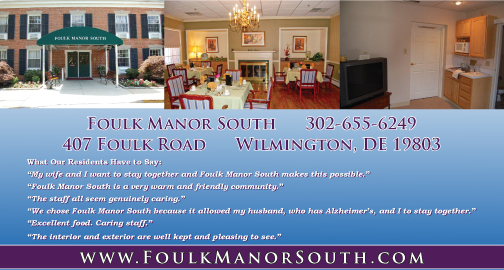 For more information about Foulk Manor South or to RSVP for “A Taste of the South” please contact 302-655-6249 and ask for Tamme Hackett. Next Story → Do You Know What SMA Stands For? You Should! Quick Facts About SMA You Should Know!